Today started out well. Landed into Los Angeles at 6:10am, no lines at customs (which is very rare), no lines at Hertz, no traffic (which is great, as I repeat in my head every time I drive "Right keep it tight" so I don't end up on the wrong side of the road). To top off the day it was about 24 degrees which was lovely. I got a full 6 hours out in trade today. Here is some of snaps that I took that may interest Fable followers with my iPhone. Picture 1: Neon is still strong in the market. This is a great pattern in sulphur green and royal blue. Picture 5: door knobs and hooks that Anthropologie has on offer. Picture 7: Let them eat cake. 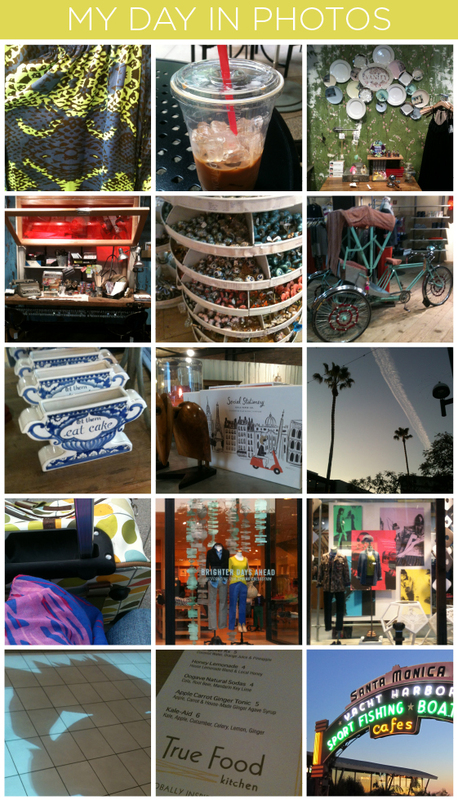 Anthropologie (I told you I loved this store. Picture 8: Social Stationary by Rifle Paper co, seen in Anthropologie. Picture 10: Lady Fable and Orla (the Orla Kiely rolling suitcase). She is the best shopping companion. Picture 15: Santa Monica Pier at sunset. Photo by Lady Fable - Sunset from Santa Monica Pier. Now of to bed to get on top of this jet lag.